Description：Chinese President Xi Jinping’s visit to the Philippines is expected to bring China-Philippines relations "a knot higher" and comprehensively deepen bilateral cooperation in each field, said Philippine President Rodrigo Duterte. Chinese President Xi Jinping’s visit to the Philippines is expected to bring China-Philippines relations "a knot higher" and comprehensively deepen bilateral cooperation in each field, said Philippine President Rodrigo Duterte. Duterte made the remarks during a recent joint interview with Chinese media in the Philippines. Duterte said that China-Philippines ties once touched a low point, but he decided to usher in a new chapter after he was elected the President of the Philippines in June 2016. Under joint efforts from both sides, bilateral relations moved back to the right track of friendly cooperation ever since. When talking about the current relations between the two countries, Duterte noted that bilateral ties have maintained sustainable and stable development, and is at a peak at present. He is pleased with the current situation and is glad to see that bilateral cooperation is benefiting both peoples. China is the Philippines’ largest trading partner. Duterte noted that more and more Philippine products, including tropical fruits, are entering the Chinese market thanks to the continuous development of China-Philippines economic and trade cooperation. The Philippines’ export to China is witnessing a rapid growth, the president added, expressing his confidence in the continuous growth of trade between his country and China in the future. Both leaders from China and the Philippines have reiterated that the two countries would further enhance alignment of development strategies. Duterte told People’s Daily that the Philippines is currently promoting large-scale infrastructure construction, and multiple projects are being implemented under the cooperation between China and the Philippines, some of which are about to be completed soon. According to him, he will further negotiate with Xi about how to deepen bilateral cooperation under the framework of the Belt and Road Initiative, and will put more into practice. Duterte remarked that as neighboring countries, the Philippines and China share similar history and cultures, as well as lifestyles of the people. He introduced that more and more Chinese tourists are visiting the Philippines, and the increasingly people-to-people exchange will further boost bilateral friendship. The Philippine President also recognized China’s support to his country in anti-terrorism and drug control, saying China, different from other countries, has given help and support wholeheartedly with no strings attached. 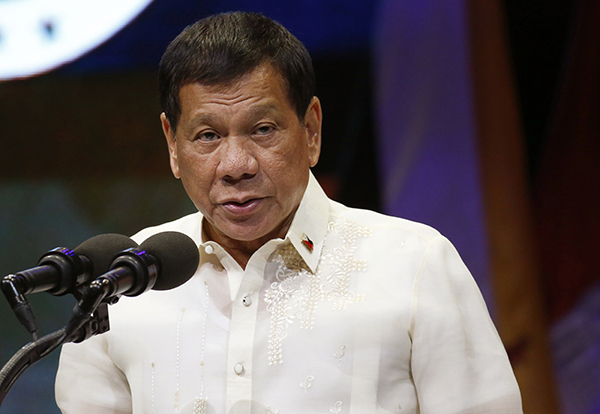 China and the Philippines have formed a community of shared future, and maintained friendship between the two countries conforms to each other’s interests, Duterte said. He hopes that the two sides can enhance cooperation in trade and economy and further strengthen people-to-people exchanges. The Philippines is willing to expand cooperation with China in national security and the safeguarding of regional peace and stability, Duterte noted. Duterte has visited China many times and witnessed the development of the country. During the interview, he hailed China’s reform and opening up, saying huge changes have happened in the country over the past 40 years. He hopes the Philippines could make the same achievements in the future. Duterte has a 14-year-old daughter who is currently learning Chinese. He disclosed that he might ask her to communicate with or sing a song for Xi in Chinese when the latter visits the Philippines. Duterte joked that his daughter is shy, but he believes she would be willing to sing the Chinese song for the visiting Chinese President, and he would let her start practicing immediately.